Non-Resident Mortgage: This is where the buyer is not a Canadian nor a landed immigrant. In this case the buyer will need at least 40% down and will face other hurdles. You need to show income to qualify for a mortgage. Several factors can affect how much you can borrow. 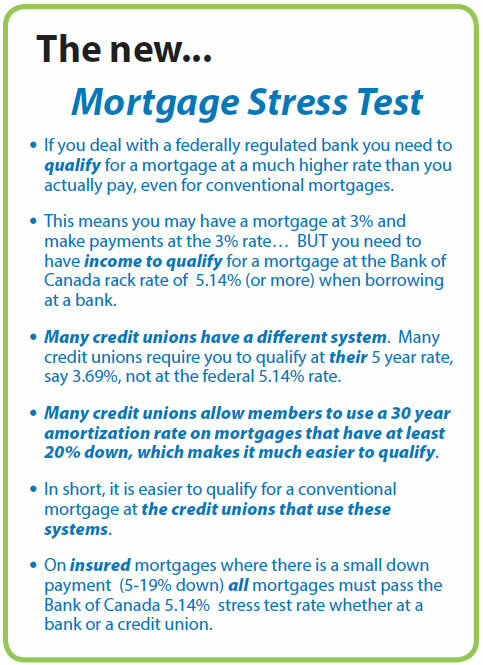 If you are not getting good results, consider a different lender or mortgage broker. For a very rough estimate of how big a mortgage you can qualify for, take your total household annual income before deductions and multiply by 4.5 for a credit union mortgage, or multiply by 4 for a bank mortgage. For example if you and your spouse/partner have a gross annual income of $100,000, you may qualify for a $450,000 mortgage. Other credit factors can affect these numbers either way. The buyer usually has the option to fix the interest rate for a certain number of years. 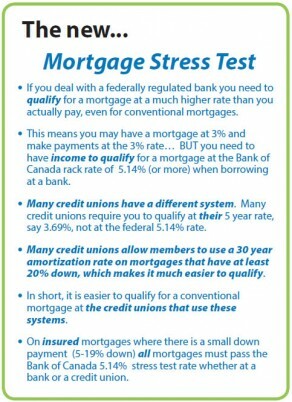 The longer you fix it for (the term of the mortgage), then usually the higher the interest rate. If you want the lowest rate and are willing to take a risk, then go with a short term. 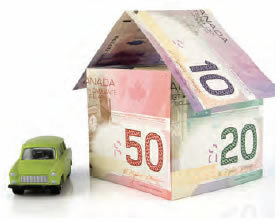 Possible long term savings are possible by opting for variable rate mortgage with the rate you pay going up and down with the market interest rates. If you have trouble qualifying for a mortgage, some people ask a relative or close friend to co-sign the mortgage, which means they agree to pay if you don’t. When talking to your bank or credit union use the price including the GST so that the GST cost is included in your mortgage. Be careful! Many mortgage companies want you to buy life insurance for your mortgage, this is optional. Often mortgage companies charge double the price for life insurance compared to what you can get on a term life insurance policy from a life insurance company.